Background: Prostate Cancer (PCa) is a major mortality cause with higher incidence in western countries and African population, and lower in Arab countries. Belgium’s population present different origins with 24.2% being immigrants and 46% descendants from outside European Union. The equal-open-access healthcare in Belgium provides an opportunity to study variations in PCa presentation among different ethnicities (Caucasians, Africans and Arabs). Methods: We retrospectively reviewed 495 consecutive patients medical records (328 Caucasians, 78 Africans and 89 Arabs) who underwent Trans-Rectal-UltraSound(TRUS)-guided prostate biopsy in our institution between January 2013 and March 2017. The parameters analyzed were: age, ethnicity, PSA, digital rectal exam(DRE), Prostate Volume, Gleason score, number of prostate biopsy cores, percentage of cores invaded by cancer and TNM classification. Results: In our cohort, Africans presented PCa diagnosis at younger age (6 years less) compared to Caucasians and Arabs (p<0.001). Arabs have less PCa diagnosis (p<0.024). After multiple logistic regression Arabs present 45.3% less PCa diagnosis compared to Caucasians (OR 2.21,95%Confidence Intervals[CI] 1.32-3.72,p<0.003) and 39.7% less than Africans (OR 2.52,95%CI 1.25-5.07,p<0.01), even though its predominantly Gleason≥7 and Gleason≥7(4+3) (OR 2.83,95%CI 1.23-6.5,p<0.014 and OR 2.44,95%CI 1.03-5.76,p<0.043, respectively) and High Risk(HR) (OR 2.37,95%CI 1.07-5.25,p<0.033) when compared to Caucasians. Africans also present more Gleason≥7(4+3) (OR 5.49,95%CI 2.25-13.36,p<0.001) and PCa≥HR (OR 4.59,95%CI 1.93-10.9,p<0.001) compared to Caucasians. 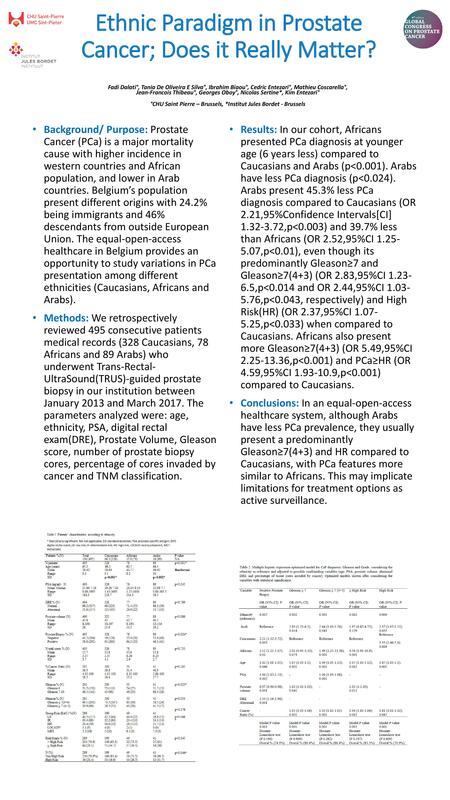 Conclusions: In an equal-open-access healthcare system, although Arabs have less PCa prevalence, they usually present a predominantly Gleason≥7(4+3) and HR compared to Caucasians, with PCa features more similar to Africans. This may implicate limitations for treatment options as active surveillance.